Classical unemployment occurs when real wages are kept above the market clearing wage rate, leading to a surplus of labour supplied. 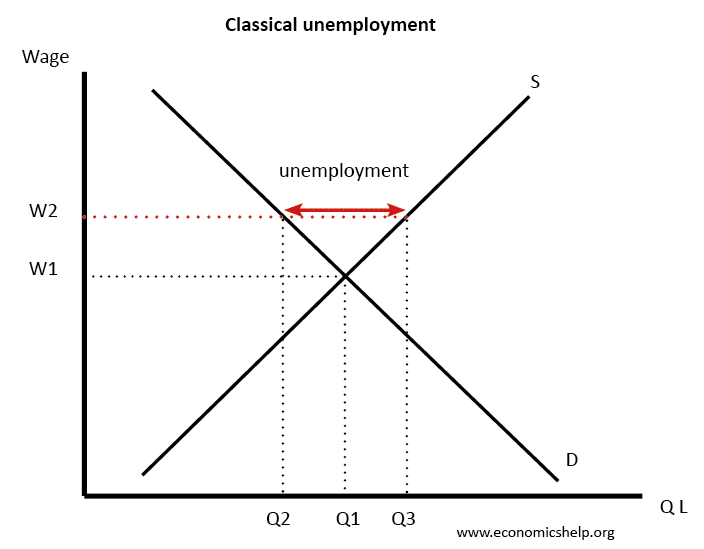 Classical unemployment is sometimes known as real wage unemployment because it refers to real wages being too high. Powerful trade unions which bargain for wages above the equilibrium. Minimum wages that create a legal minimum for wages. Classical economists stress the importance of this type of unemployment. They argue that if wages were more flexible, then most unemployment could be solved. However, Keynesian economists argue it is not as straightforward. They argue the problem may be a lack of aggregate demand (AD) in the economy. For example, if wages are cut, it could lead to a further fall in AD, as workers have lower wages. In this case, cutting wages may be ineffective in solving classical unemployment. Also, if there is monopsony, then minimum wages and trade unions may not be causing unemployment because monopsony employs less than market equilibrium.